After a leisurely lunch sat on the remains of a wall of a ruined building we were ready to resume our search for new species. We were now close to the remains of the Golden Dagger Tin Mine. Further back along the valley, in what would have been the medieval village of Challacombe, villagers would farmed field strips known as lynchets. We headed roughly in a northerly direction. 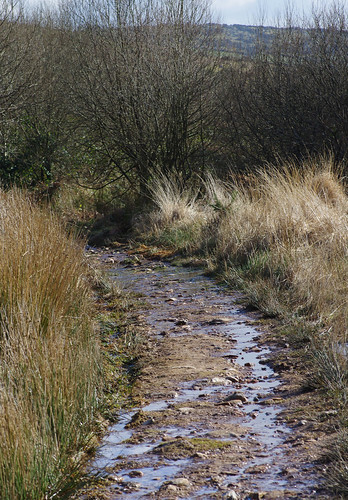 Along the valley was a mixture of wet woodland, streams and freshwater pools. It would have been beneficial to know the age of the trees. 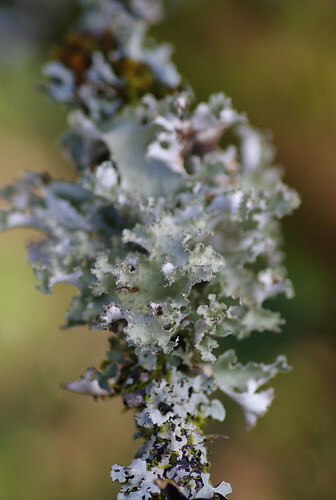 One thing we did surmise was that apart from the odd newly erected fence (built so walkers and animals do not stray off the path towards disused mine areas liable to collapse) the habitat has been undisturbed: the perfect hunting ground for lichens. This looks most like Parmotrema crinitum although it lacks the black cilia found on the surface and at the margins of the lobes. 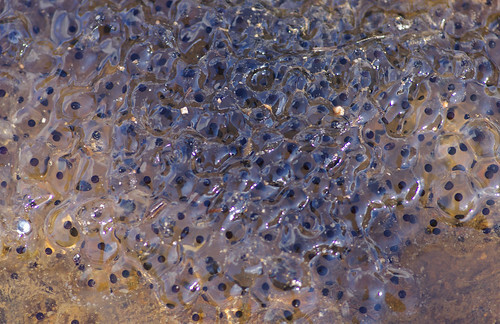 Frogs lay their eggs in masses whereas toads lay theirs in strings. 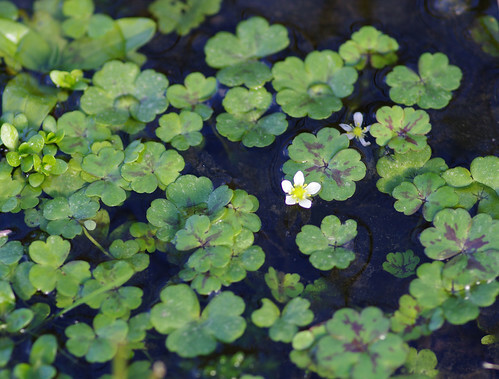 There were quite a few masses in the pools and at the sides of streams. This looked like a professional display that you might see at a garden centre or even a horticultural show. 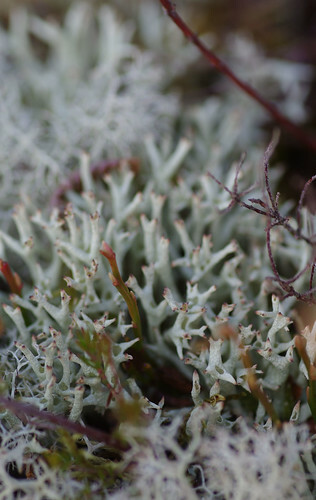 The lichens in the foreground are Cladonia gracilis. The podetia can be relatively tall compared to similar species. The way Sherry has composed this shot gives the impression that the Cladonias stretch back for quite some distance. The reality was only a matter of feet. I can't think why but the drooping capsules reminded me of Edwardian lampposts. The shape, height and colour of the capsules were key factors. This species is easier to identify in wet conditions. The leaves are green and spread out, whereas in dry conditions they are spirally twisted and tangled like the image above. 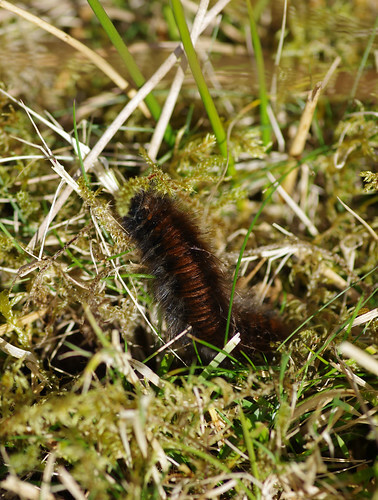 The caterpillars of this species are common in heathland habitats. But we had not expected to see any in mid February, especially since it had been so intemperate. It transpired that March was even colder than February. I only hope this one has managed to survive. The stream was clear but slow-moving and in places occupied by plants. Crowfoots can usually be determined by the shape of the leaves. 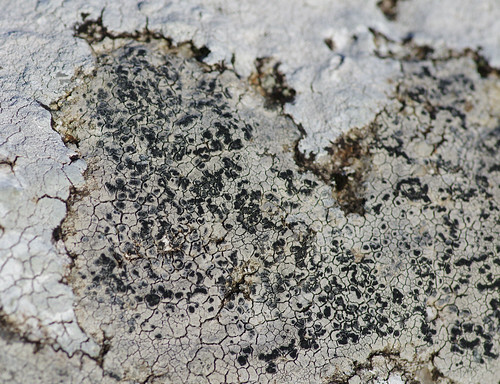 The image above shows two different species of lichen. The black patches are examples of Arthonia varians. 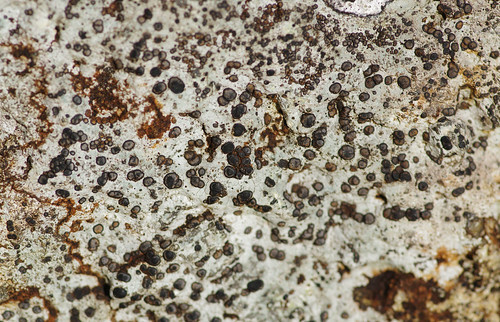 This species prevents the development of the apothecia of its host, Lecanora rupicola. 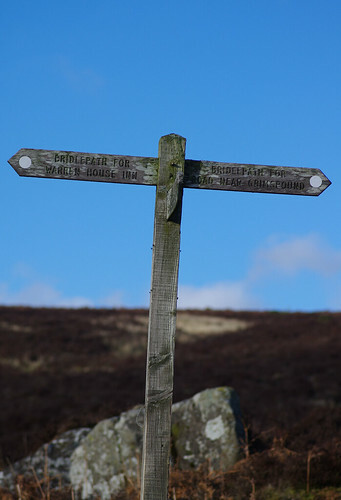 At the junction of footpaths we turned right and followed a path uphill. The disused Birch Tor and Vitifer Tor mines were close by on the map but we could see no evidence of their presence. Our path bordered a sheep enclosure for a few yards. And there were plenty of other things ready to divert our attention away from admiring the landscapes, to the smaller scale of things. 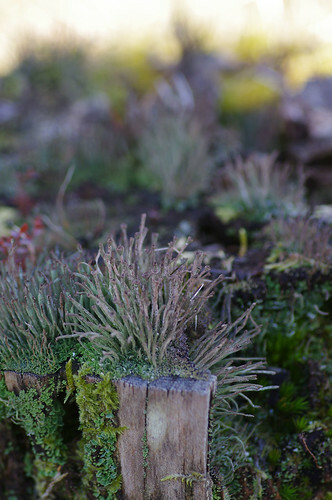 I wish we would have spent a little longer taking more detailed observations of this haircap moss. I think it might be Common Haircap Moss (Polytrichum commune variation commune). 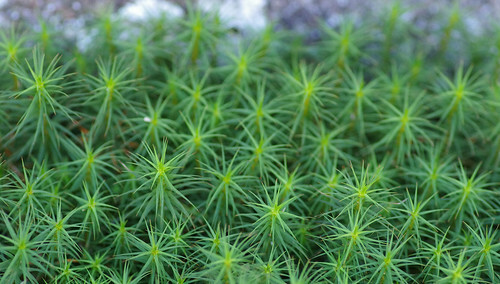 The leaves are definitely toothed and it has a starry appearance from above: two of the distinguishing factors of Common Haircaps. There are two possible subspecies (variation uncialis and variation biuncialis). 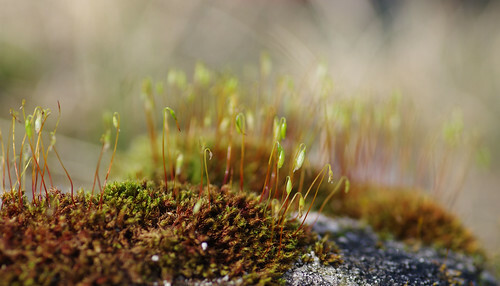 I'm not certain which the image above belongs to but the former is rare and said to be confined to parts of Scotland and the north, while the latter is thought to be more prevalent in heathland habitats throughout England. Initially I thought ours looked more akin to the rare version but now I'm not so sure. In truth, there is not a lot of difference between them in appearance and an expert is probably needed to verify the identity. It might have been cold but we were blessed with a clear blue sky on the last leg of our journey. We ploughed straight ahead for Grimspound. We could see the car from a distance. On reaching the road, Sherry insisted on a little detour. Just off the road there was a nook. And within that nook we sat in the cosy remnants of a house. 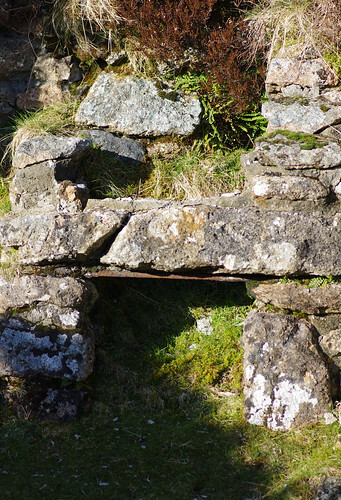 This was its fireplace. We stayed there for a while, enjoying a snack and the winter sunshine. There was a relaxed atmosphere and we agreed the last people to have lived there were a lively, vivacious bunch. But where there is somewhere to sit there are often walls; walls that need examining and the usual quota of guesswork. Due to the evidence of rust on the thallus this could well be another version of Lecidea lithophila. 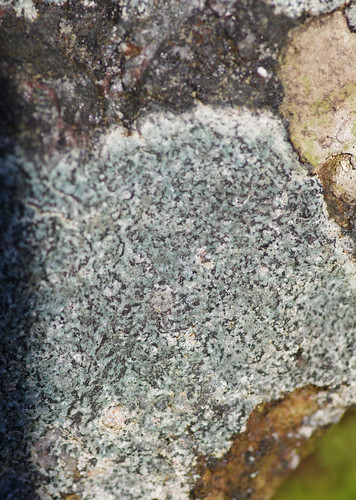 This grey-green specimen presented the last mystery of the day. As well as the contrast of colours it seemed cracked and crystalline. There were no apothecia which is consistent with their being rare for the species. Our example does not look as sorediate as it should, however and the thallus is noticeably thinner in the image above. By this point, though, our trained eyes had got a bit fatigued and we left the fireplace behind, promising to come back again in the future. Our thanks go to Jane Redman for joining the expedition and being patient while we frequently interrupted the rhythm of a good walk.